the mini apes, and I do miss that. clutch and brake cables weren't even close to fitting with the new bars. length.The +8 length fits perfect. different travel locations to pick from). Friday. I also ordered my brake fluid just to make sure I had enough to qualify for free shipping. forward or too far back, then you will not benefit from the change of handlebars. would have to recommend doing it. 1. Always unplug main fuse. 2. Remove two screws on the clutch control assembly on left side of handlebar. 5. Remove front brake master cylinder from right handlebar. 6. Carefully remove the wiring harness retainers, I was able to reuse mine. to slide the bars through. 9. Slide right hand control and throttle assembly off detached handlebar. disconnect from connector under the gas tank. 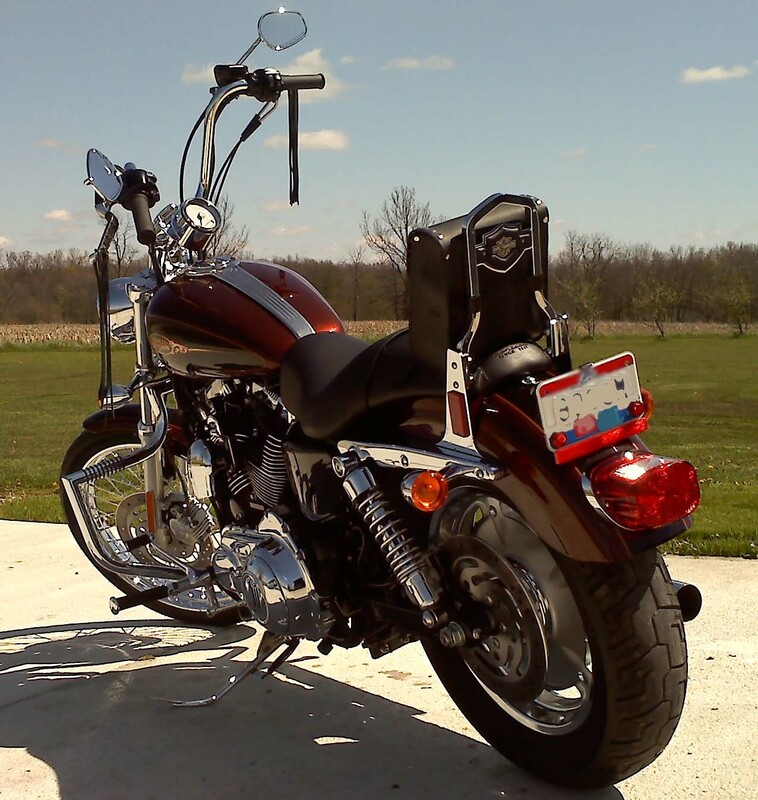 Shopping for Handlebars for your Motorcycle? Don't forget to check out Amazon! Changing the handlebars on your Harley-Davidson®. Do you want to feel a little more in control of your bike? Feel a little uneasy in certain situations? Does your back hurt when riding? Maybe a change of handlebars is all you need. 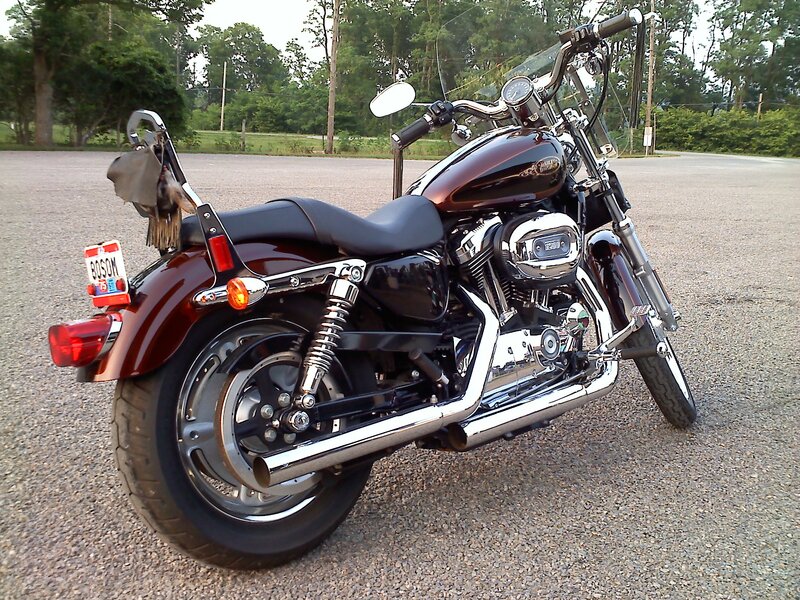 I have added a few ‘after market’ or ‘custom’ parts to my 2009 Harley-Davidson 1200C Sportster. waiting until I upgrade my air intake, then I may go with a different exhaust) Watch for review! • The extended foot pegs from Harley-Davidson. impossible to haul anything without a sissy bar to tie down to. • An oil dipstick with the temperature gauge, it comes stock without temp. gauge. • Turn Signal (also called directional lights) re-locater. I moved my turn signals to the forks. motorcycles, shop around for what fits you and your budget. top heavy, in comparison to the other family members of the Harley-Davidson line up. Harley-Davidson®, Drag Specialties, Kuryakyn, The Gremlin Bell®, and all other marks are trademarks of their respective owners.